Photo: Beall-Dawson House, ca. 1815, 103 West Montgomery Avenue, Rockville, MD. Built by Upton Beall, Clerk of the Montgomery County Court. 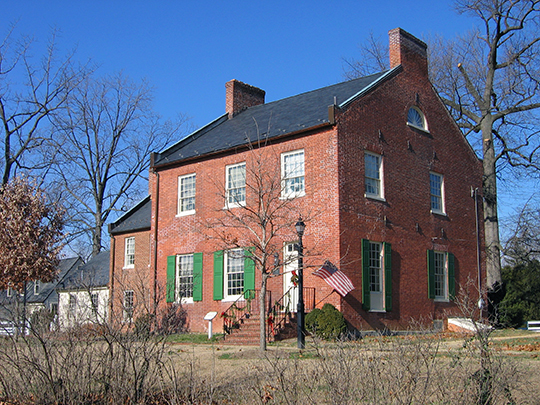 It is now a museum, operated by the Montgomery County Historical Society. Listed on the National Register of Historic Places in 1973. Photographed by User:Aude (own work), 2005, [cc-by-2.5 (creativecommons.org/licenses/by/2.5)], via Wikimedia Commons, accessed January, 2013. Montgomery County Courthouse is located at 100 Maryland Avenue, Rockville MD 20850; phone: 240-777-7900. Montgomery County administrative offices are located at 101 Monroe Street, Rockville, MD 20850; phone: 240-777-0311. On September 6, 1776, the County of Montgomery was formed out of the "Lower District of Frederick," and named in honor of that illustrious hero, General Richard Montgomery, killed at Quebec the previous year. The county furnished a conspicuous part of the Maryland Line during the Revolution; also, troops in every subsequent war in which the country has been engaged. The first school of any reputation in the county was a seminary for young men, established toward the close of the Revolution, and memorable as the alma mater of William Wirt. The Rockville Academy (1809) and Brookeville Academy (1814) were next chartered and liberally endowed. In the early history of the county corn and tobacco were the staple products of the soil, until it became so exhausted that Montgomery lost by emigration to the new country beyond the Ohio River large numbers of her population. In 1790 the population was over 18,000 and, fifty years later, 15,456. By the introduction of guano in 1845 by the Society of Friends, a wonderful advance was made in the growing of cereals and grass, and the value of land and farm products materially enhanced. The population of Rockville at the beginning of the 20th century was about 1,200 residents.